From a young age Adel developed an interest in business as he used to travel a lot when he was younger. Adel developed a strong work ethic from a young age by having a close relationship with a local business in his home town of Algiers, Algeria. It was these experiences that spurred him on to further his studies. Adel has travelled from a young age and has also been lucky enough to visit London a few times before coming to study here. He was aware that visiting and moving to a city were completely different things, and felt mentally prepared to adjust quickly in order to resume a normal life in a new city, and all the opportunities that it offered. One of the reasons Adel chose to study here in London is because he wanted to develop his English, and as a result he attended intensive English classes for 3 months achieving a high English academic level within this time, making him eligible to study at LSBU. He’s now continued to flourish learning the language, and plans to stay in London and work once he graduates. Adel is studying a sandwich degree which means he’s now applying his experience of being an international student to help other prospective international students. 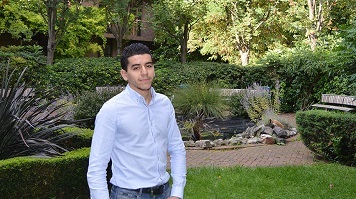 Adel has secured a one year placement working in LSBU’s International Office, which will benefit our students, but also give him a deeper insight into the process and stages involved for international students coming to study here at LSBU. Adel has really embraced everything that LSBU has to offer students who choose to study here. He’s an active member of the Academy of Sport, attending gym classes regularly, and utilising the FTZ Zone, along with more business related opportunities. Recently he took part in the UBC challenge organised by IBM, and is now a member of the Institute of Directors, which is something offered to students here at LSBU. Furthermore, something that prospective students can gain experience from, is the Business Solutions Centre, where students apply to be business advisors to small businesses in the local area. The selection panel is extremely competitive for the Business Solutions Centre, so whilst Adel didn’t get selected this time, he’ll be putting his application in, as he firmly believes in development and furthering his knowledge for when he comes to graduate.